Pancakes in our house aren’t just reserved for Shrove Tuesday. 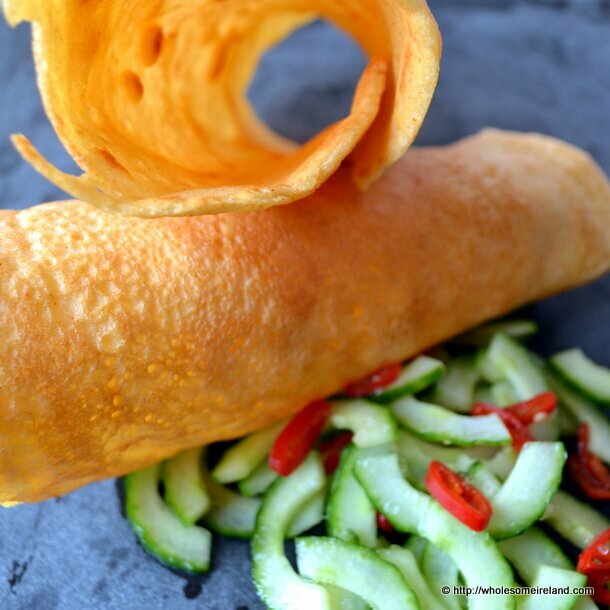 These dosa (Indian style savoury pancakes) are very simple to make and pair very well with my Nana’s speedy pickle. Do you associate pancakes with wheat flour? Do you waddle away from the table after traditional pancakes feeling bloated? Dosa are the perfect antidote for that feeling. There is no wheat flour at all in this recipe and it’s part fermented to make it even easier on your stomach. Traditionally Dosa batter would be fermented over a number of days in a warm place but my kitchen is tiny so space is at a premium. I use yeast to kickstart the batter instead, which brings the sitting time right down from at least 3 days to 3 hours. I love using the Dosa to scoop up the pickle but the hubby prefers to pop some eggs on top with some spices and chilli, then lashes the pan itself under the grill. Either way it’s great as a snack or a main meal. This recipe serves our family of 4 plus 1 weaning baby comfortably. Place the flours, paprika, salt and sunflower oil in a large bowl and stir so that the sunflower oil is mixed thoroughly. It’ll appear like breadcrumbs. In a cup combine the yeast and lukewarm water and stir well with a fork until it’s dissolved. Pour the yeast mixture and the 2 cups of cold water into the large bowl on top of the flours and whisk well. The batter should become like a thick pouring cream. If you feel that it’s too dry, then add a little more water until you get the right consistency. Cover the bowl with cling film and leave to prove in a warm spot for approximately 3 hours. Once ready, cook the batter by the ladleful in a lightly oiled frying pan on a medium heat. Fry until the bottom is golden brown then flip. To get the “roll” effect, drape the cooked pancakes over a rolling-pin directly from the frying pan once cooked. For the pickle you will need 1/2 cucumber, 1 red chilli, 1 tablespoon of white wine vinegar and half a teaspoon of sea salt. Slice the cucumber in half and using a teaspoon, scoop out the watery seeds. Slice the cucumber finely, along with the chilli and place both in a bowl. Pour the white wine vinegar and sea salt on top and stir well. Serve immediately. Your dosa look much tidier than my dosa which tend to fall apart a little – but maybe that’s because I use the natural ferment method ‘cos our wheat intolerance person is also baker’s yeast intolerant – and about a billion other things intolerant. I do confess that we ate (and relished) a further 8 dosa that didn’t make it to the photographs because they fell apart. I found that if I made them as thin as crepes, they cracked when I lifted them from the pan so had to accept that they were thicker. I think the natural ferment method really adds to the flavour though. 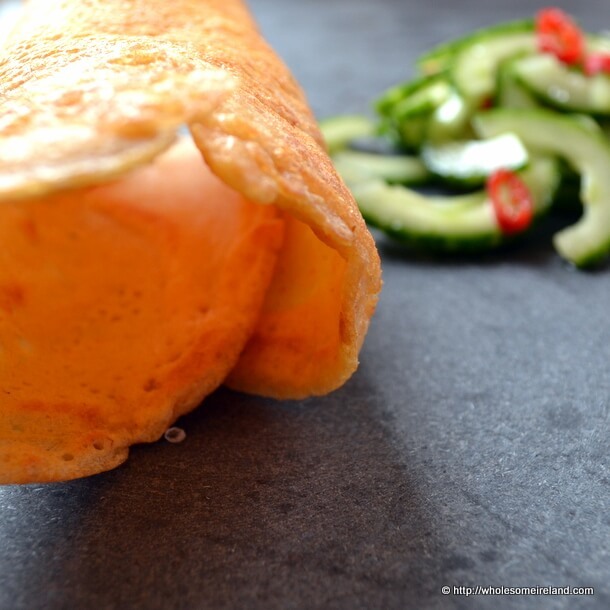 oh yeah… definitely want to make some dosa soon … these look great!! They are my new favourite pancake David. Far easier on the stomach than the wheat based traditional pancake. My next aim is to find somewhere to hide the batter so that I can naturally ferment.